1. Foreword - Why Learn Programming? 2. What is a Programming Language? Here is a set of examples where we take a program that already exists and put everything in functions. Next, create a main() function. Put everything in it, and call the main function. # Call the main function to get the program started. When you do this, run your program and make sure it still works before proceeding. Next, pick an item to move to a function. Start with an easy one if you have it. I chose grass because it was only one line of code, and I wasn’t going to ever try to position it with x, y.
""" 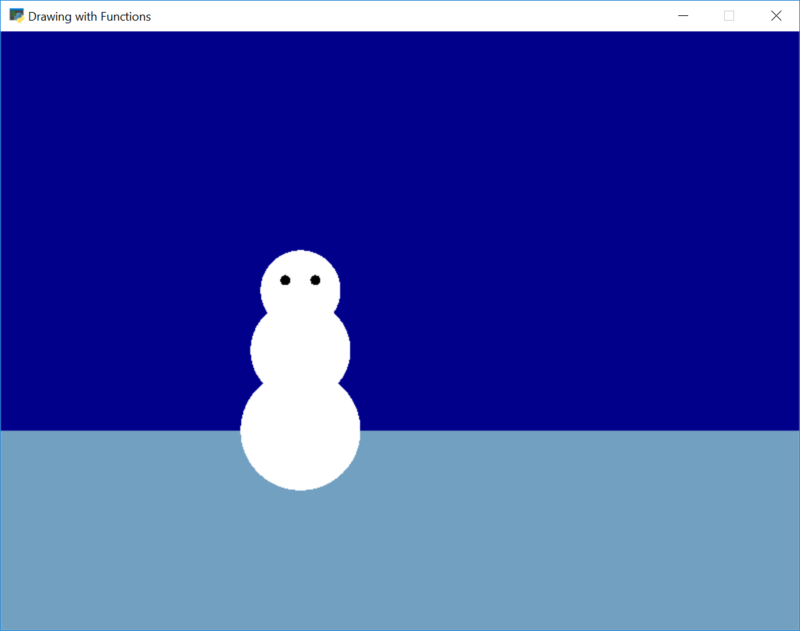 Draw the ground """
Then, I took a more complex shape and put it in a function.
""" Draw a snow person """
But this draws the snowman only at one spot. I want to draw lots of snowmen, anywhere I put them! But that’s not perfect. If you’ll note, I added a dot at the x and y. 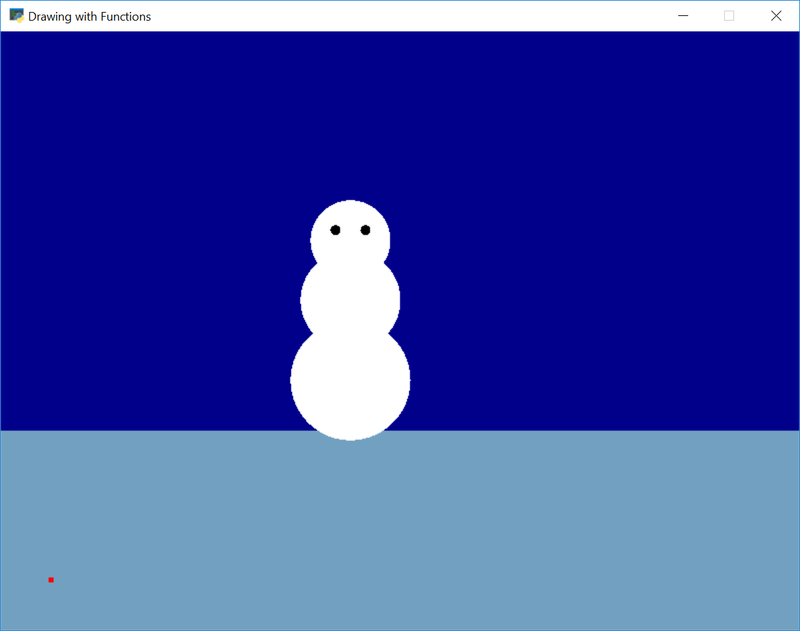 The snowman draws way off from the dot, because originally I didn’t try to draw it at 0, 0. I need to recenter the snowman on the dot. We need to re-center the shape onto the spot we are drawing. Typically you’ll need to subtract from all the x and y values the same amount. We can animate our drawing if we want. Here are the steps. Right now our program only draws our image once. We need to move all the drawing code in our main to an on_draw function. Then we’ll tell the computer to draw that over and over. # Call on_draw every 60th of a second. Do this with your own program. Nothing will move, but it should still run. Next, we are going to create a variable inside of the on_draw function. This variable will hold our x value. Each time we call on_draw, we’ll change x so that it moves to the right. # Negative numbers move left. Larger numbers move faster. 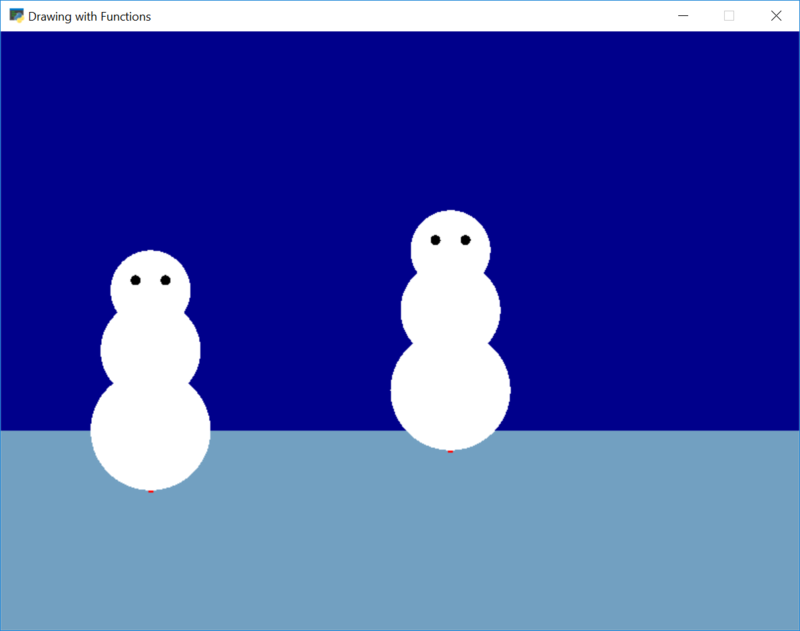 # Create a value that our on_draw.snow_person1_x will start at. For more information, see the Bouncing Rectangle Example.